The Machu Picchu Citadel can be visited alone, but Wayna Picchu (also called Huaynapicchu) or Machu Mountain can also be visited. These 2 sites are the mountains on each side of Machu Picchu and their entrance is from Machu Picchu, i.e. 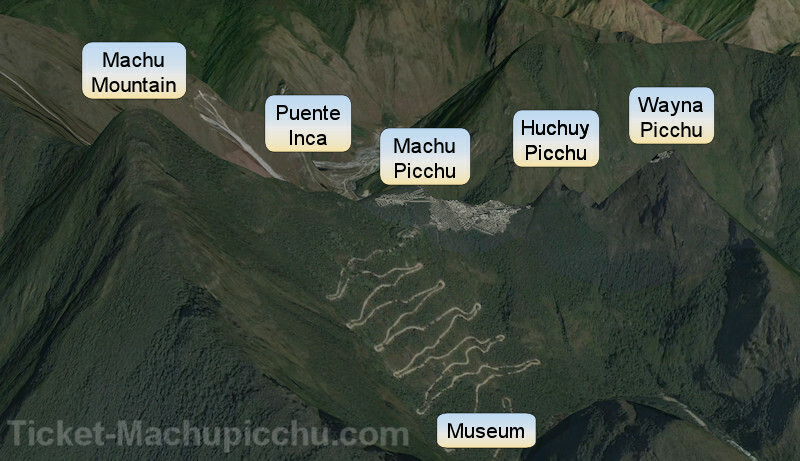 you have to pass the Machu Picchu entrance control to access these sites. For the same reason, it is therefore impossible to buy a separate ticket for Wayna Picchu or Machu Mountain without Machu Picchu. These two sites can only be visited in the morning. Wayna Picchu, which means Young Mountain in Quechua, is the smallest mountain. The ascent lasts about 1 hour and the descent also 1 hour, so 2 hours in total to visit it. The route is established and its access is open to everyone, even children. Its ascent is recommended if you want to have a breathtaking view of the entire Citadel of Machu Picchu. Sometimes, especially in winter (December to February), fog prevents a good view, but often fog is quickly released. Machu Mountain, which means Old Mountain, is the bigger mountain, which faces Wayna Picchu. Its ascent lasts 2 hours and 2 hours to get back down, so 4 hours in total to visit it. Here again, the route is established and its access is relatively easy although some areas may present some difficulties because of the steps. Nevertheless, the access is totally safe and only requires a good pair of shoes. It is not necessary to be sporty or prepared but the ascent can be tiring, especially considering that the visit takes a total of 4 hours. If the view from Wayna Picchu is impressive, the view from Machu Mountain is really fabulous. It is physically and technically impossible to visit both sites on the same day, so you must choose one. First of all, it should be taken into account that a ticket for Machu Picchu with or without an additional site is valid for a maximum of 4 hours, even if in practice the authorities accept that visitors stay a little longer. This means that if you choose to visit Wayna Picchu, you will have about 2 hours to visit this site plus 2 hours to visit Machu Picchu. These are normal durations and you will fully appreciate the 2 sites, without stress. If you choose to visit Machu Mountain, there is almost no time left to visit Machu Picchu. These restrictions are a factor in choosing between the two: choose to visit Wayna Picchu if you want to have plenty of time to visit Machu Picchu on the same day. If you prefer the overall view, then choose Machu Mountain. Also if you want to visit Machu Picchu as a challenge. If you have young children, if you want to visit Machu Picchu for at least 2 hours on the same day or if you don't have the courage to climb stairs for 4 hours, then choose Wayna Picchu. Finally, many people prefer to stay 2 days in Aguas Calientes to visit one site on the first day and the other on the second day and most are fully satisfied with the quiet visit of the Machu Picchu citadel alone. The famous pictures of Machu Picchu as a whole are taken precisely from the guardian's house at the top of Machu Picchu. Book the trek » No spaces left? Book the trek » When to book ?